For the second year in a row, Apple will be hosting the 2008 WWDC Bash at Yerba Buena Gardens in San Francisco. Beginning at 6:30 PST, the event will have live music and food to celebrate a hard week of work and draw closure to WWDC 2008. The party is currently scheduled to end at 9:30 PST and it is unknown who the live music will be provided by. As always, stick with theiLife.com for the latest coverage, as Sidney San Martin will be in attendance of the WWDC Bash tonight. Photos and text updates to follow! 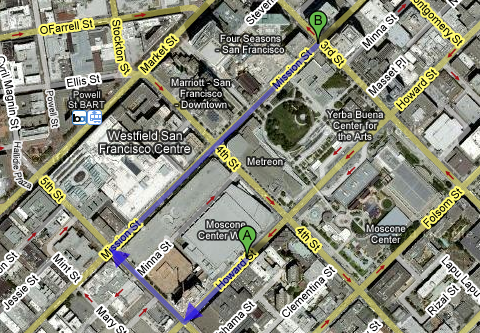 Below are important details for tonight’s WWDC Bash at Yerba Buena Gardens. Wristbands—If you intend on enjoying beer or wine this evening, you will need to pick up your wristband at any Registration Counter on Level 1 before going to the Bash. Please bring a government issued photo ID and your conference badge. Entrance to the Bash at Yerba Buena Gardens—Please enter Yerba Buena Gardens on Mission Street, between Third and Fourth Streets (Fourth Street runs between Moscone West and the Sony Metreon). You must be wearing your conference badge to be admitted to the Bash. 1:59PM PST: Just after Lunch here at WWDC, more sessions are beginning and I have obtained not obtained my wristband to get into tonight’s party (that’s only for 21+ attendees)! More content coming soon. 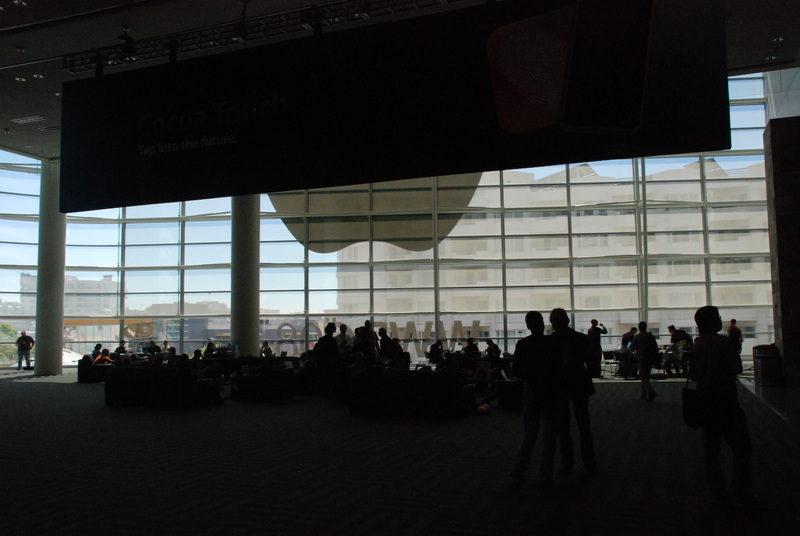 7:38PM PST: Arriving at WWDC bash, new photos posted! Check the liveblog at live.theilife.com!! Stump the Experts is structured as a game show in which the audience acts as one team, and the experts on stage are another. 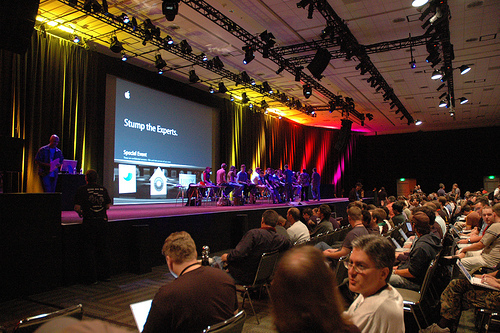 The audience may ask the experts any question related to Apple in an attempt to “stump” them, hoping to earn a point for their team. Conversely, experts may ask the audience questions that any audience member may try to answer. Any and all resources are allowed including source code, the Internet (e.g., Wikipedia & Google) and cell phones. Host Fred Huxham describes it as an “open book test”. Stump the Experts is chaotically hosted by Fred Huxham and Mark “The Red” Harlan. Songs – The 7-8 songs played before Stump the Experts begins are chosen by Fred, the leader of the show for the past 15 years. Audience members may come up to the microphones and guess the artist and name of the songs to win prizes and get points for their team. Images – The experts create cryptic images that represent Apple-related phrases or information. The audience must decipher the image’s meaning. This innovation was introduced by Craig Marciniak in 2006. Standard – Questions about arcane Apple knowledge. Sidney San Martin from theiLife.com is attending the 2008 Stump the Experts and will be transcribing some of the questions as well as bringing back photos. Check back soon. Today was another very laid back day. Ending the day with Stump the Experts and the Apple Design Awards was fun- check out the related posts below! Now that we are more than halfway through our week at WWDC, here is a summary of Wednesday, some in pictures, some in videos and some in text. 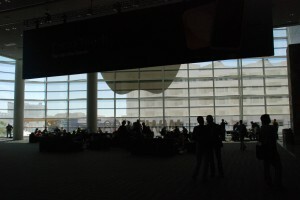 Remember to stick with theiLife.com for continuing coverage of WWDC 2008 via our Liveblog and Twitter throughout the rest of this week! If you would like to request anything or to meet up, please contact us!